Due to the severity of the injuries to the victim, his life could not be saved. Crews stood by for investigators to take over the scene. Once the investigation was completed, crews returned to the scene to further assist investigators. All Beverly Fire crews were clear of the scene at 1722. During the month of August, the Beverly Fire Department and Chief Paul Cotter welcomed Toussaint Lebeugle of Angers, France to spend time with firefighters at Beverly Fire Headquarters. Lebeugle, 19, has served as a volunteer "Sapeur - Pompier" in his home town, and upon graduation from high school, he asked to come and learn about American firefighting. Lebeugle has admired and studied American firefighting ever since 9/11, and his interest has grown during this visit. Toussaint spent seven days at the station where he performed housework duties with the on duty firefighters, took part in department training and rode along on Truck 1 as an observer. �Toussaint was a pleasure to have with us� said Deputy Chief Peter O�Connor, �he was anxious to learn about how we do things here and even explain how their operations differ from ours. It was a great learning experience for all of us�. Lebeugle's visit to the United States was coordinated by Tim Averill of Waring School, which has an established exchange program with a high school in Angers. Toussaint was hosted by Ione Barrows and Tom Perkins (both seniors at Waring) and by Tim and Lauren Averill of Beverly. At 1138 on August 25, Firefighters on group 2 were dispatched for a report of a building collapse in the area of 157 Essex St. Crew were surprised to find a major structural failure of an unoccupied structure at that address. As crews approached, they noticed that nearly three quarters of the structure had collapsed completely covering the sidewalk in front of the building. Deputy Chief Petrosino called for utility companies to respond to the scene to insure that there were no live utility hazards and also called for a representative of the building department. 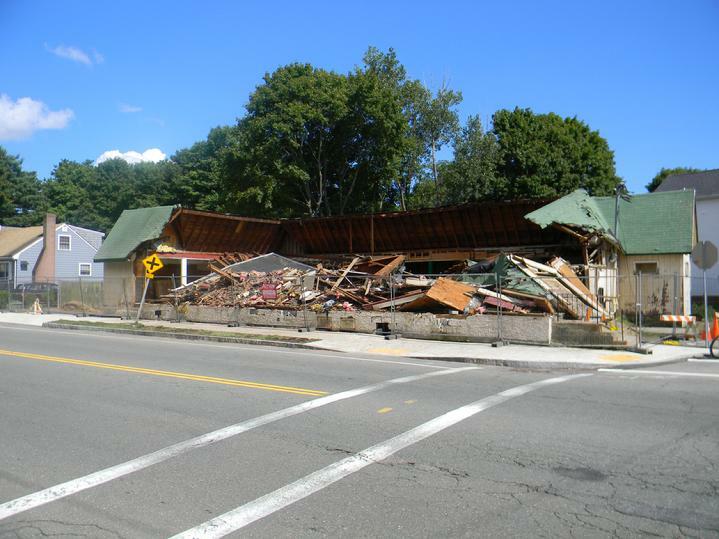 The building, an old Lil Peach convenient store, had been vacant for some time and it is presumed that clogged water drains on the flat roof allowed an excess of water to build up creating a load that was too great for the weakened structure. There were no injuries as a result of the collapse but demolition crews had to remove the collapsed portion of the structure from the sidewalk. All fire units were clear of the scene by 1219. At 1200 on August 24, Engine 3, Truck 1 and Car 2 were dispatched for a report of a motor vehicle accident in the area of 195 Hart St. Upon arrival, Lt. Robert Bergeron found a collision between a small passenger car and a JRM Trash removal truck. The victim in the car was found to be in cardiac arrest. After removing the victim from the vehicle, life saving efforts were initiated and the victim was transported to Beverly Hospital by firefighters and EMT�s from Northeast Regional Ambulance. Engine 3 remained on the scene while investigators looked over the scene. All Fire units were clear of the scene by 1442. After 37 years, Beverly Fire Alarm Operator Jack Smallwood has retired from full time duty. 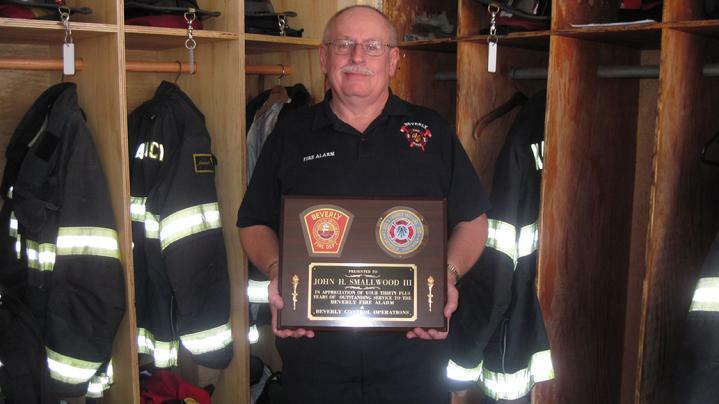 Smallwood has been around longer than the most senior active firefighter working for the Beverly Fire Department and has always been a respected dispatcher who has a reputation for getting crews all of the information they need when responding to an incident before they even have to ask for it. His experience is unmatched in the area. In addition to knowing about the Fire Service across the North Shore, Jack took pride in knowing what was going on in the fire service across the nation with close friends that were in Fire Department Communications or Suppression Operations across the Country. He often took his vacation time to drive across country to different places where he knew other fire service professionals and spent time with them at their departments. Jack�s most recent memorable incident occurred November 22, 2006 when an explosion rocked the Danversport area of Danvers. When the shockwave rolled through Beverly, Jack quickly became the point person for emergency communications. As the Town of Danvers needed resources, it was Jack�s responsibility to find them and get them there. Within a very short period of time, Jack had mobilized Fire service units from across the county and converged them all upon the small Town of Danvers. Due to the time of night, Jack was operating all by himself and by the time anyone was able to get in to help him, the bulk of the work had been done. More often, Jack could be heard making the routine dispatches. From fire alarm activations, to car crashes and medical aids, Jack�s knowledge of the Fire Service and the City often proved to be a tremendous asset to responding firefighters. When firefighters were responding to obscure addresses, Jack was always on the radio giving helpful information before the Officer on the truck even had a chance to grab the trucks map book. Additionally, Jack�s knowledge of the equipment in the Fire Alarm Office helped communications go unbroken during sometimes where aging equipment tried to prevent firefighters from effectively communicating. If a piece of equipment was acting up, Jack knew how to fix it or how to bypass it until someone could get there to fix it. Jack was honored at a retirement party where fire service professionals from across the county stopped by to pay tribute. Congratulations Jack, Stand by your phone! !